For over twenty years Columbus religion teacher Deacon James Dugard has been fighting for the protection and the defense of the unborn throughout the United States. 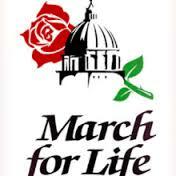 One way that Deacon Dugard has done this is through the March for Life. The March for Life is an annual gathering of pro-life men and women in Washington D.C. who peacefully protest legal abortion in America. The first March for Life was held on the steps of the Capitol on January 22, 1974. Ever since 1974 hundreds of thousands of Americans have come to the nation’s capital to be a voice for the unborn. This year Deacon Dugard and five Columbus students will be attending the march. During their time in Washington D.C. they will be visiting the Holocaust Memorial Museum, attending a prayer vigil outside the Supreme Court, attending mass at the Basilica of the National Shrine of the Immaculate Conception, attending retreats, and participating in adoration of the Blessed Sacrament and going to Reconciliation. Over 300 students from the State of Florida will be attending the march and most Catholic high schools will be represented. Many Columbus faculty have participated in the march including religion teachers Mrs. Alegret and Mr. Ibarra. Former Columbus principal and current provincial of the Marist Brothers of America, Br. Patrick McNamara F.M.S., has also participated. Before Deacon Dugard was involved with the march another faithful and devout Roman Catholic, Fr. William Kidwell S.J., would lead large groups of high school and college students to the march. Fr. Kidwell was a member of the Society of Jesus (Jesuits) and an active member of the Catholic Church in Miami for many years. After his passing in 2008, Deacon Dugard and Mrs. Joan Crown, the current director of the Archdiocese of Miami Respect Life Ministry, were tasked with running the trip to Washington D.C.
May almighty God and the Blessed Virgin Mary continue to give Deacon Dugard the strength and the courage to protect and defend the unborn.